Check out the fabulous attraction Blackpool has to offer. 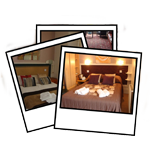 Come and look at out Guest House, check out the pictures in our gallery. Give us a Call today to find out more..
"The Kirkstall Guest House is a comfortable family run establishment situated in the heart of Blackpool, Just a short walk from the Promenade and Blackpool Tower." Our excellent service, good home cooking, cleanliness, friendly atmosphere and outstanding value for money resulted in us winning the Blackpool Tourism ‘Guest House of the Year‘ award. There is so much to do in Blackpool...stroll along the seafront to the tower or take a trip to Blackpool's unique tram system to the Pleasure Beach and Sandcastle complex. Keep browsing our website to find out even more information.